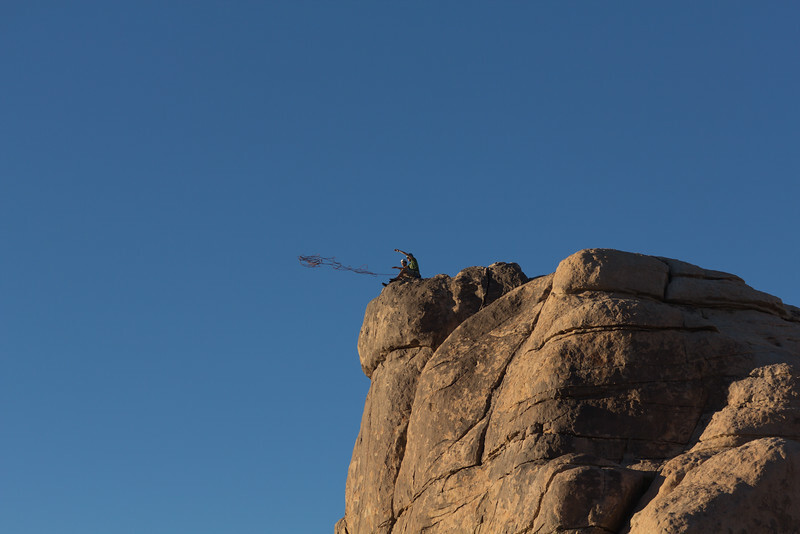 After unpacking camp on Wednesday, we headed over to Intersection Rock to try and squeeze in a route before the sunset. 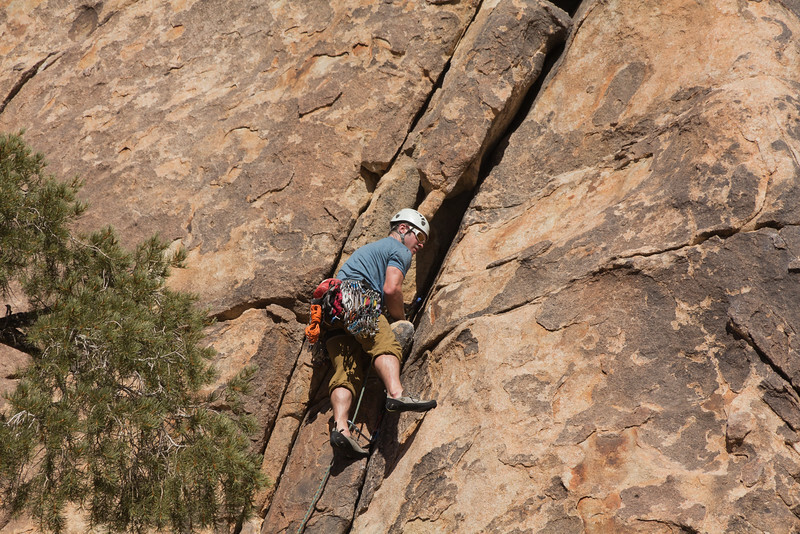 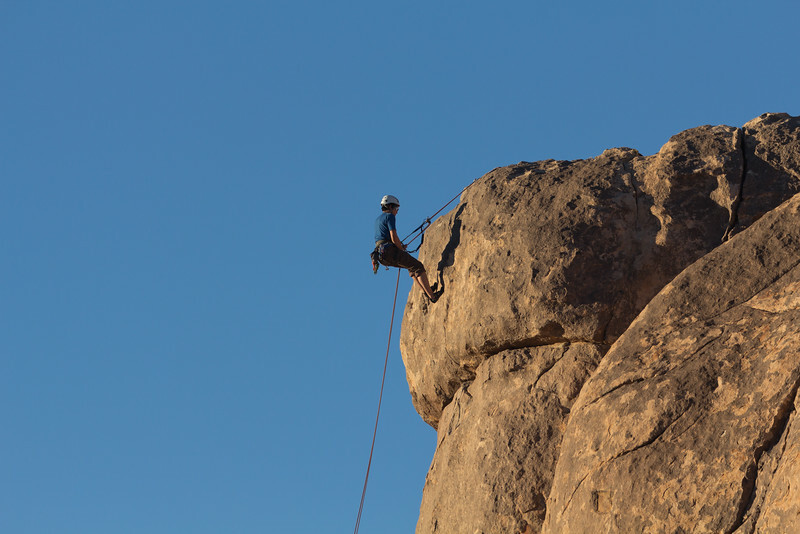 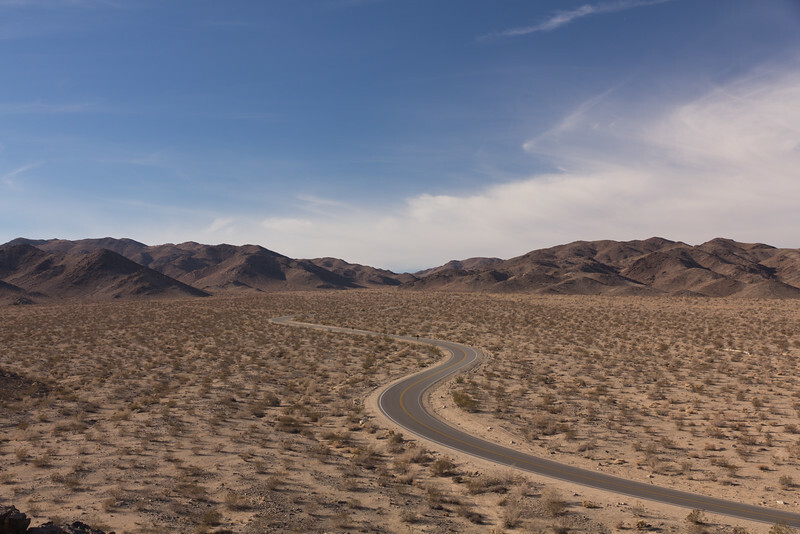 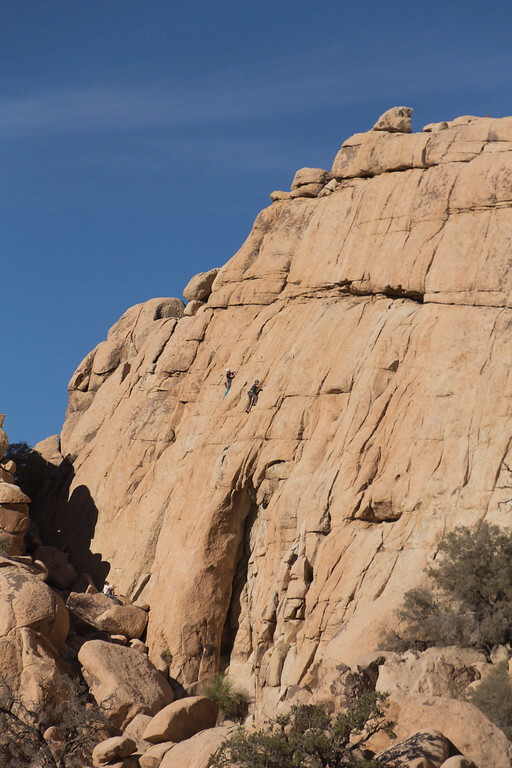 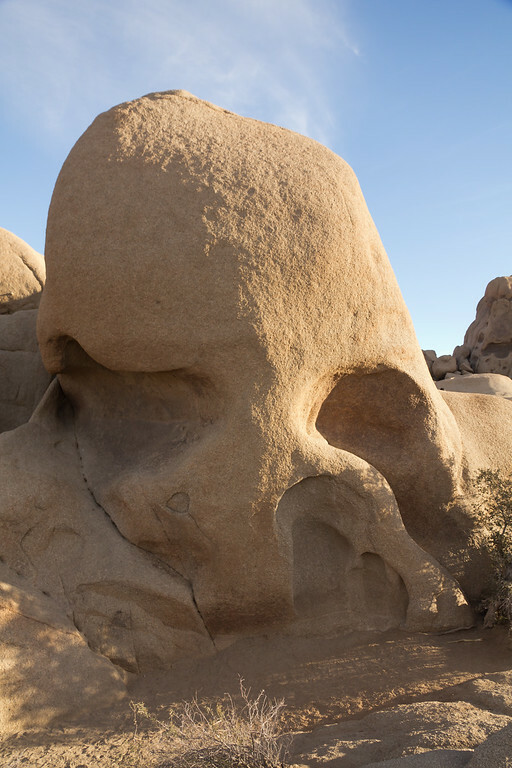 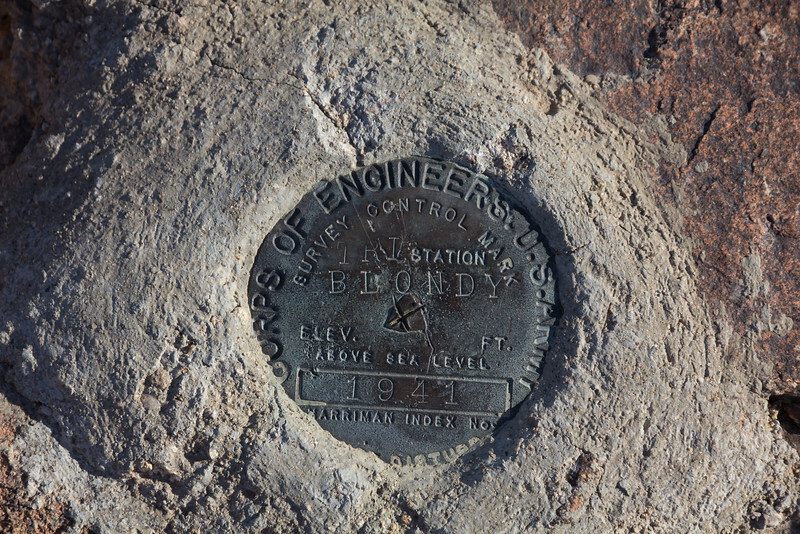 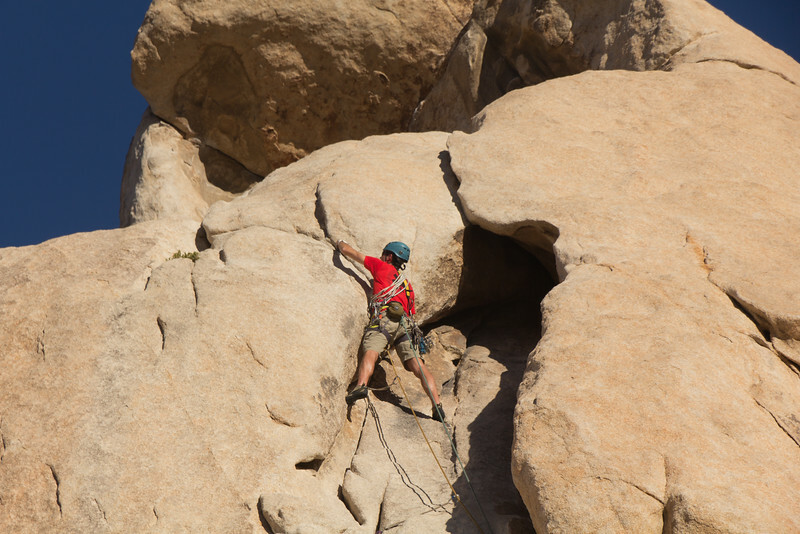 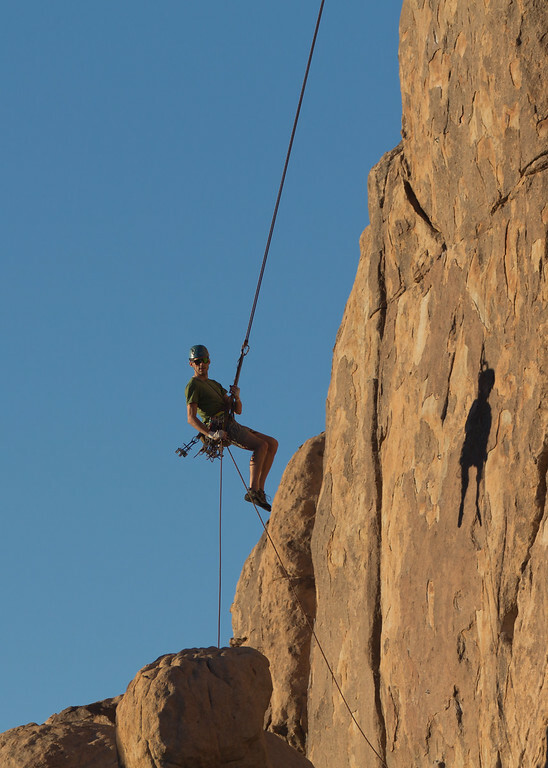 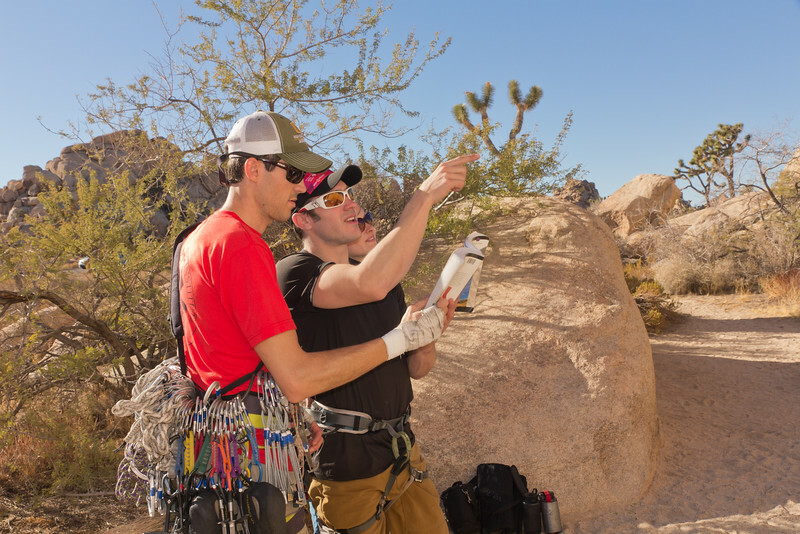 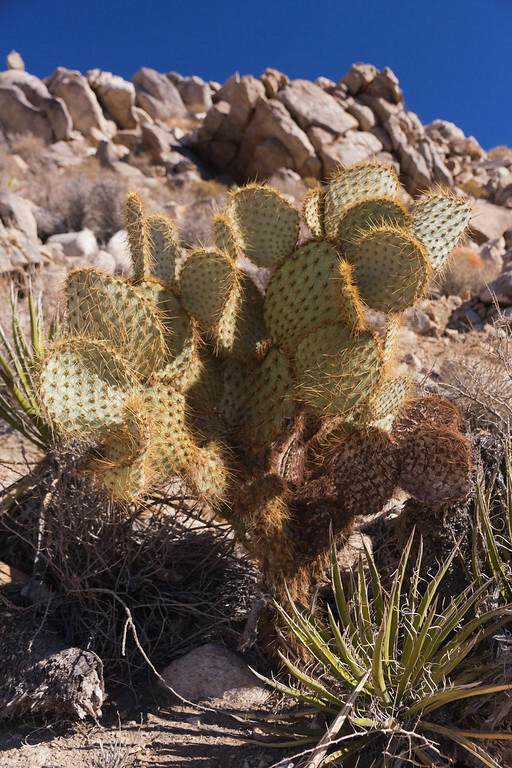 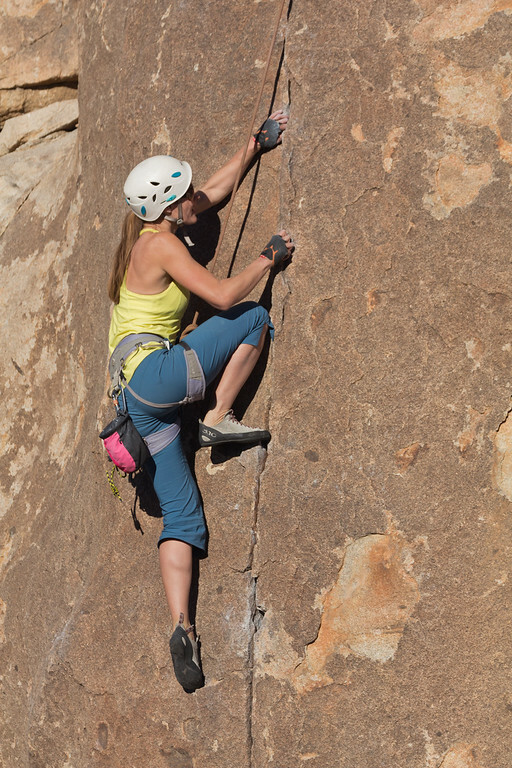 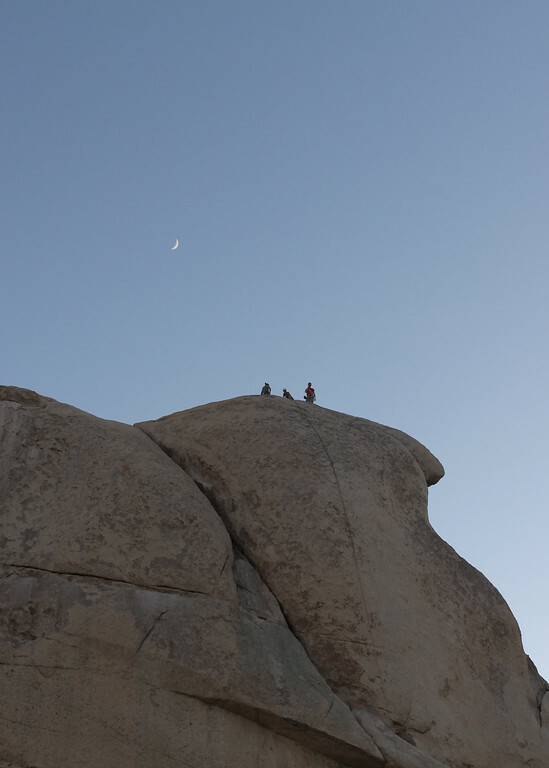 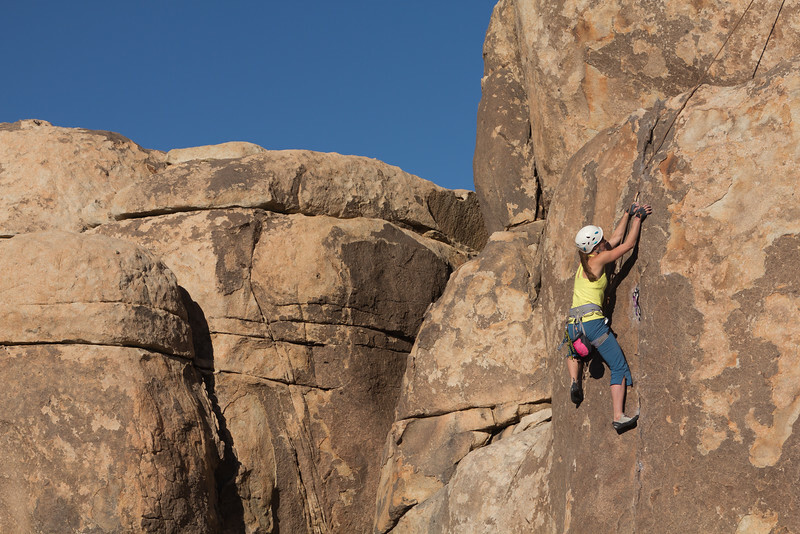 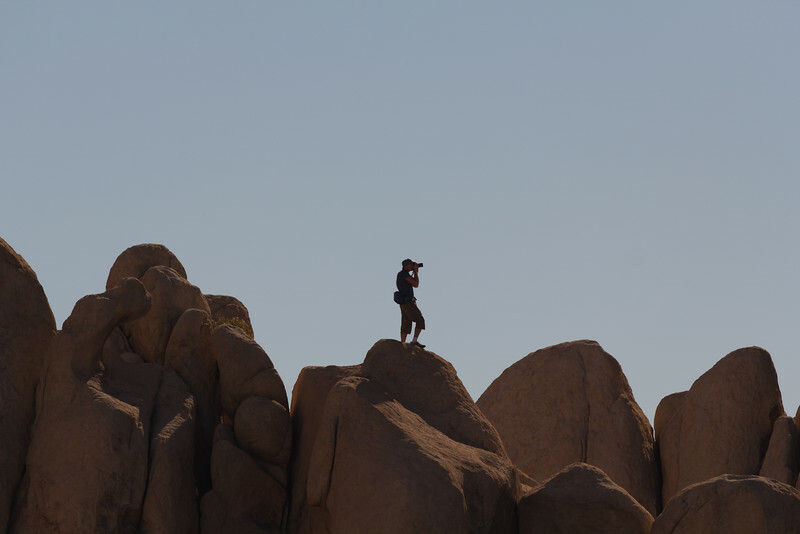 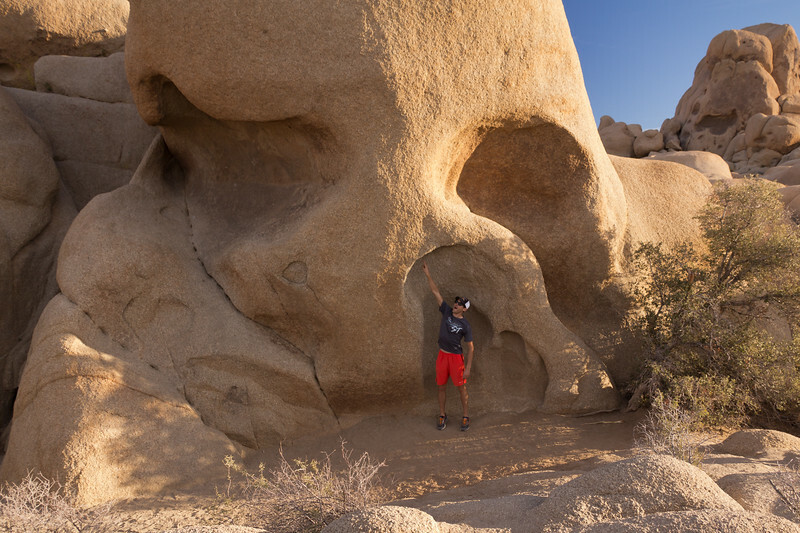 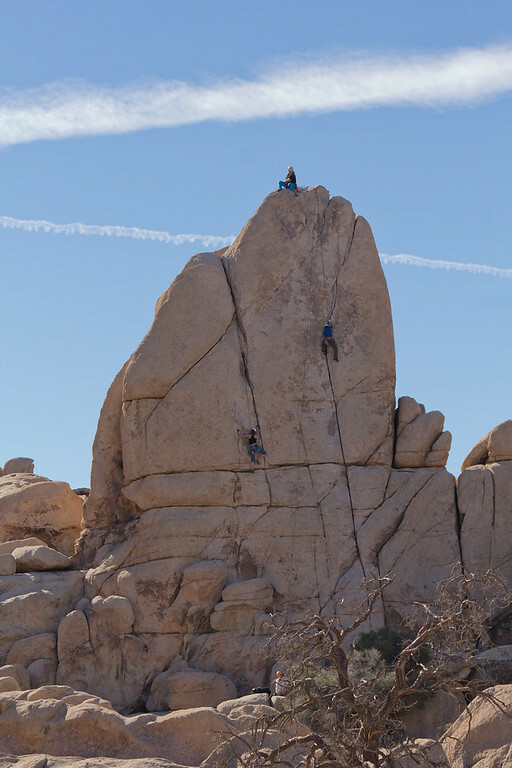 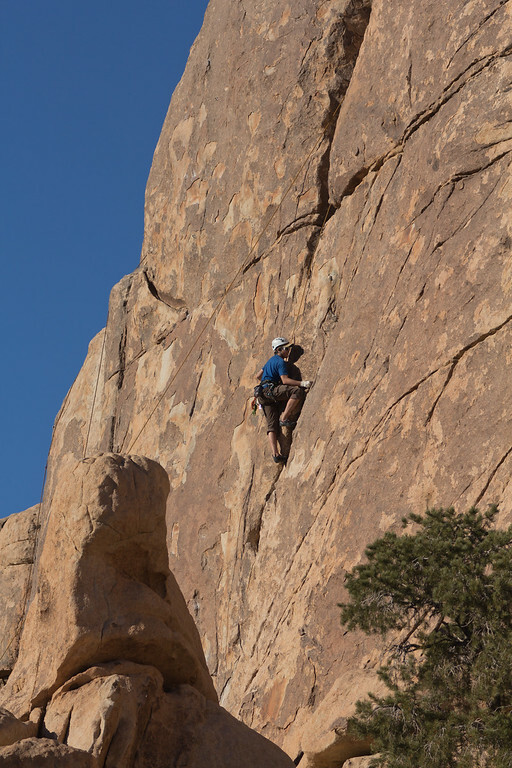 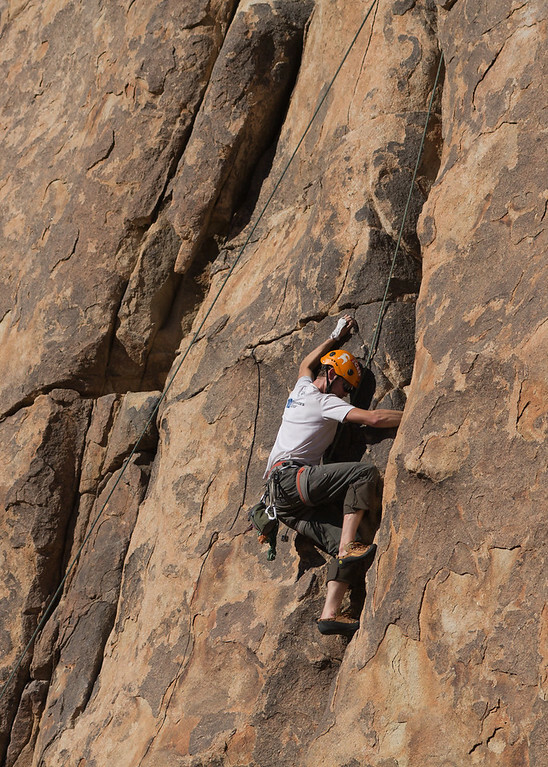 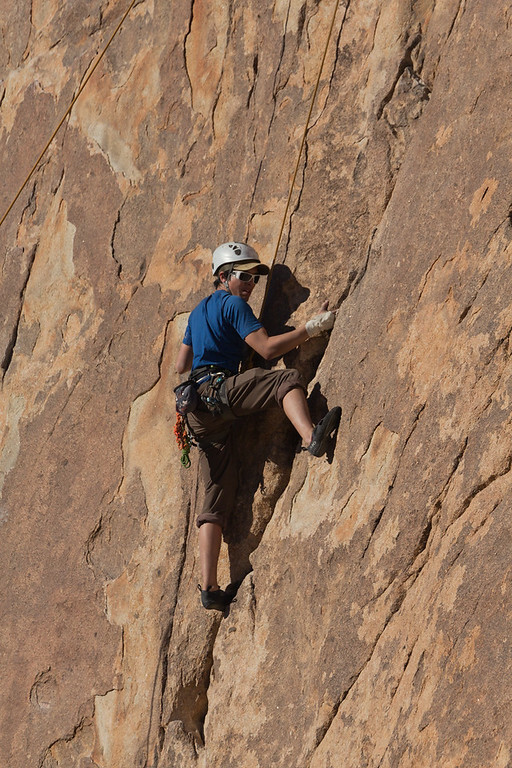 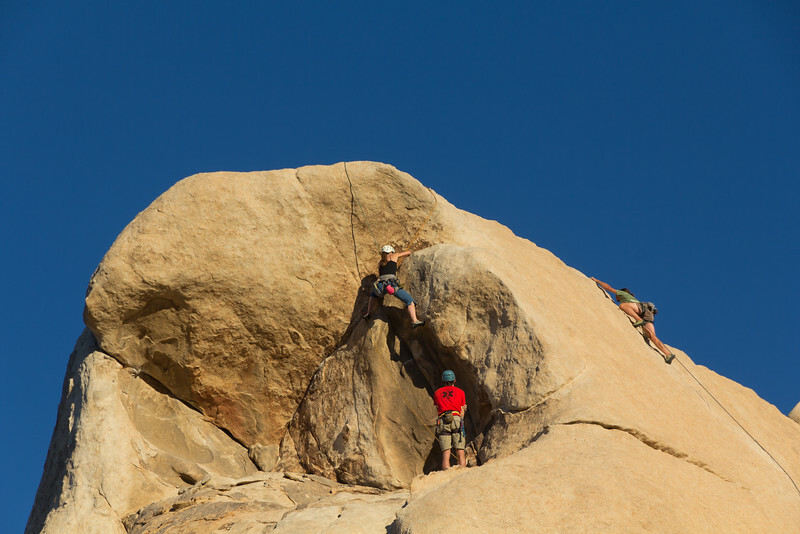 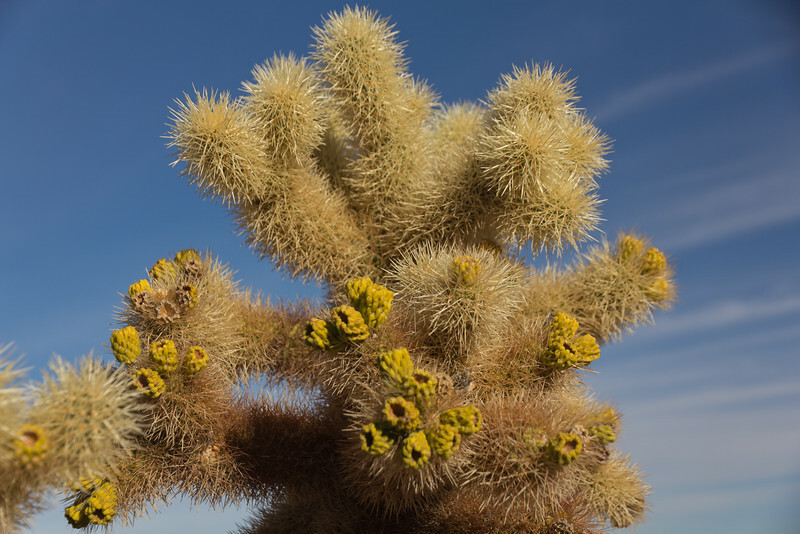 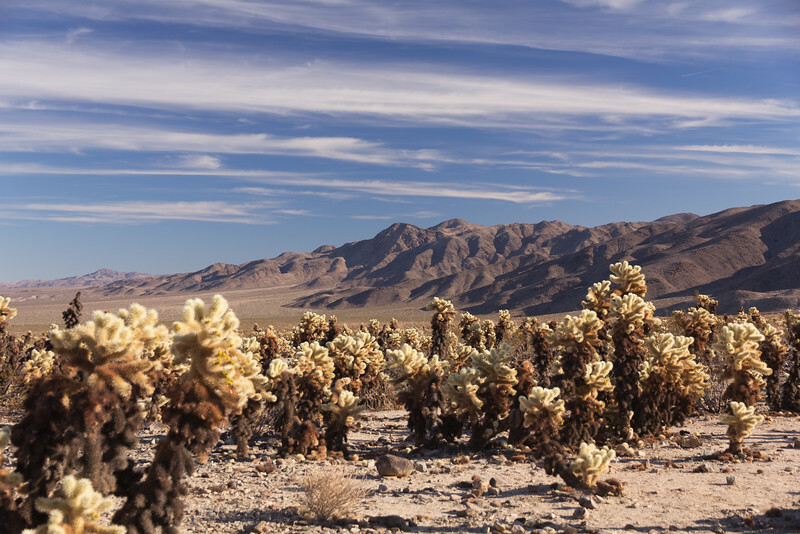 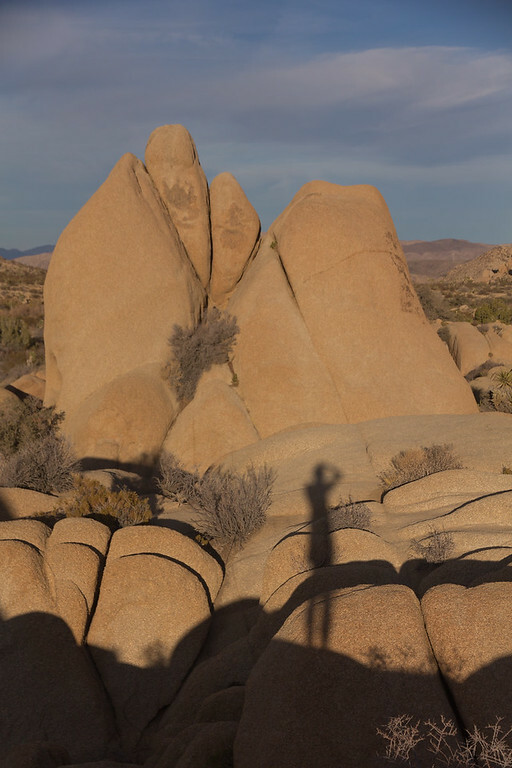 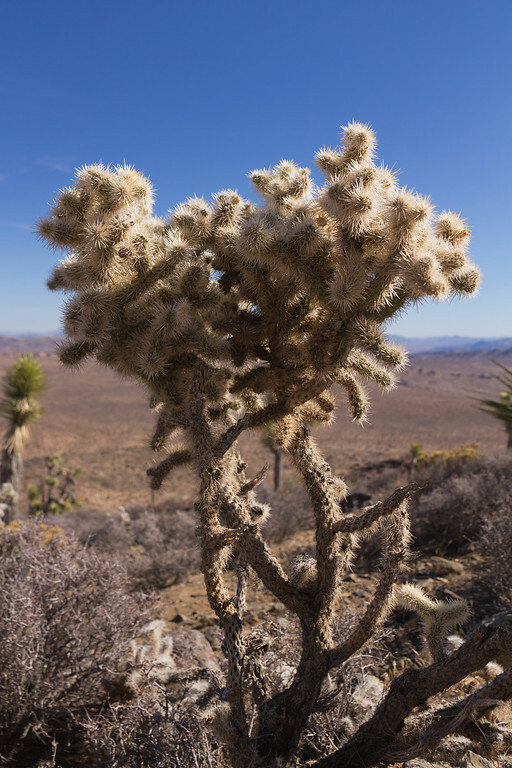 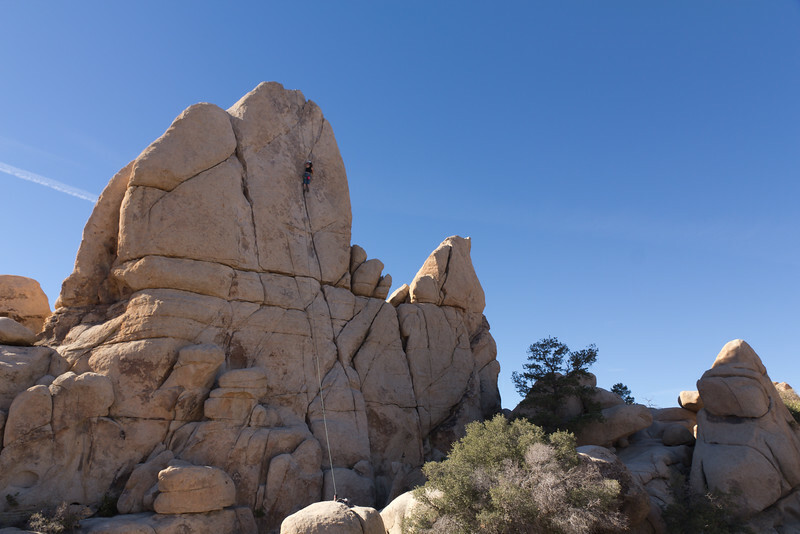 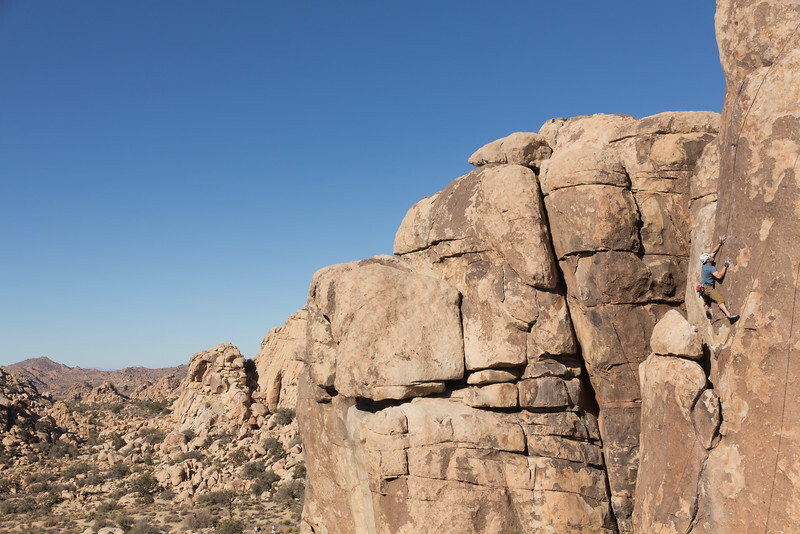 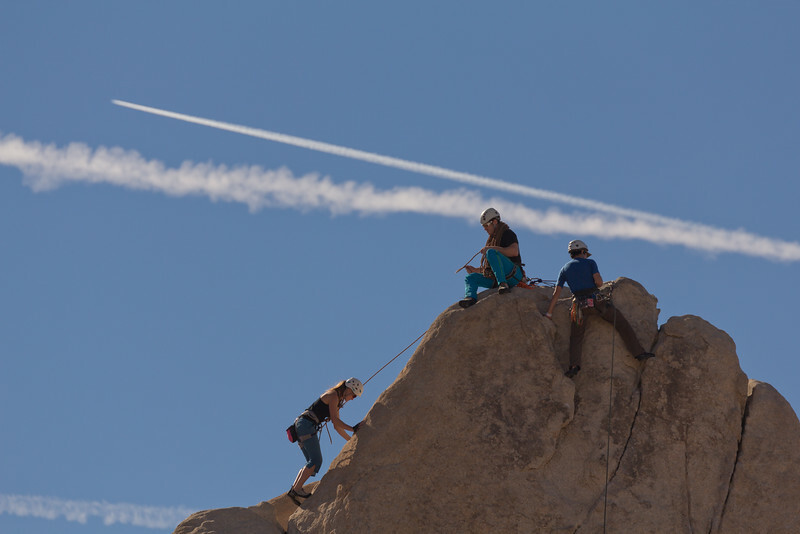 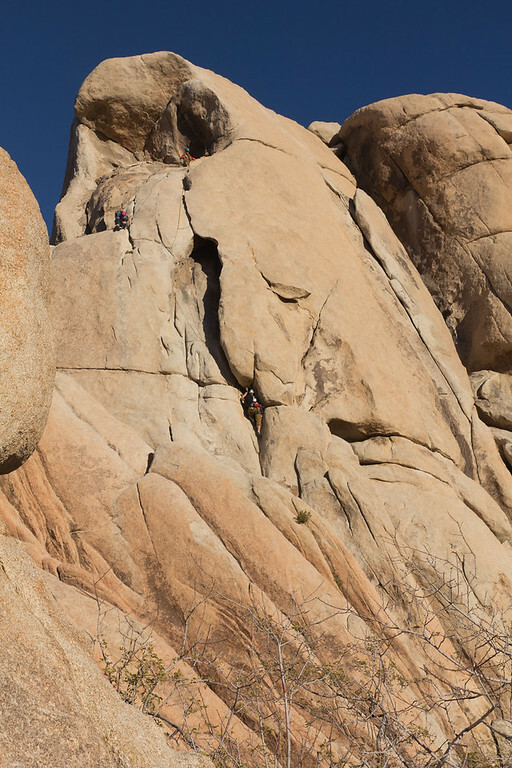 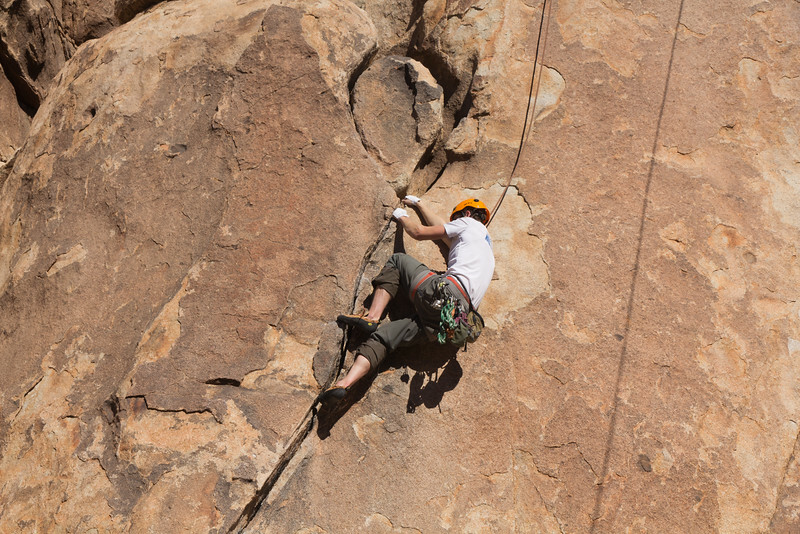 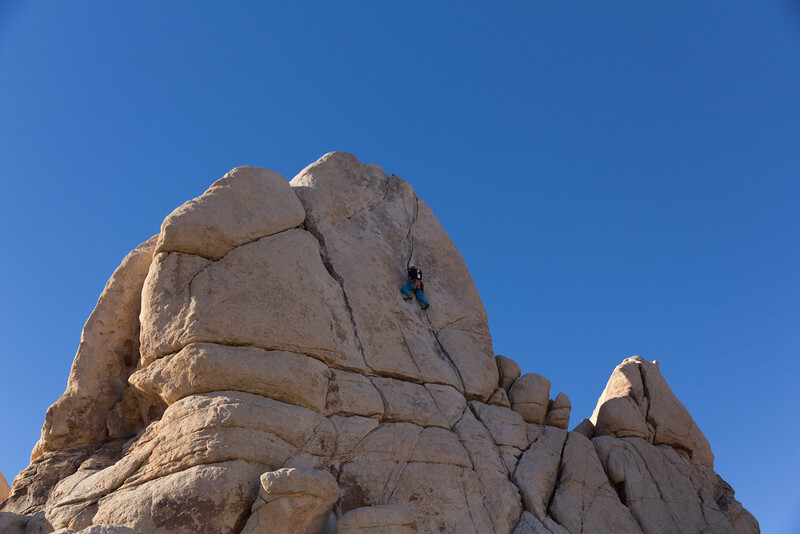 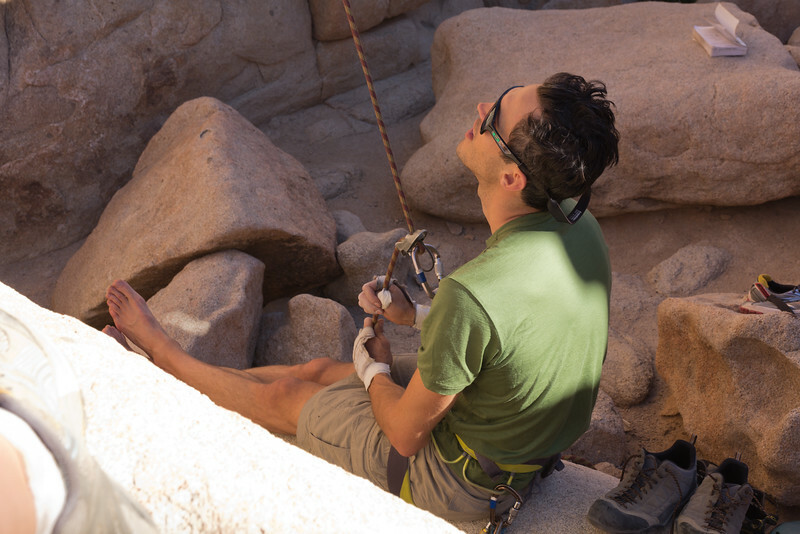 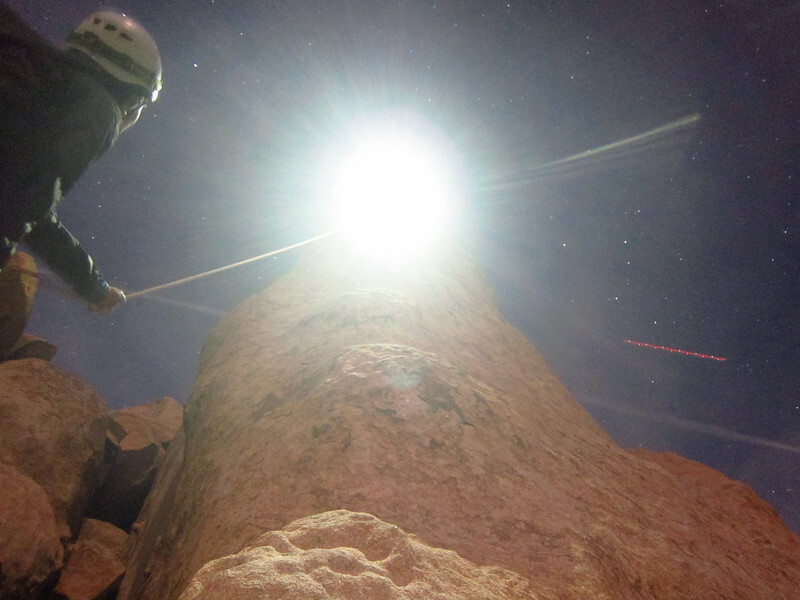 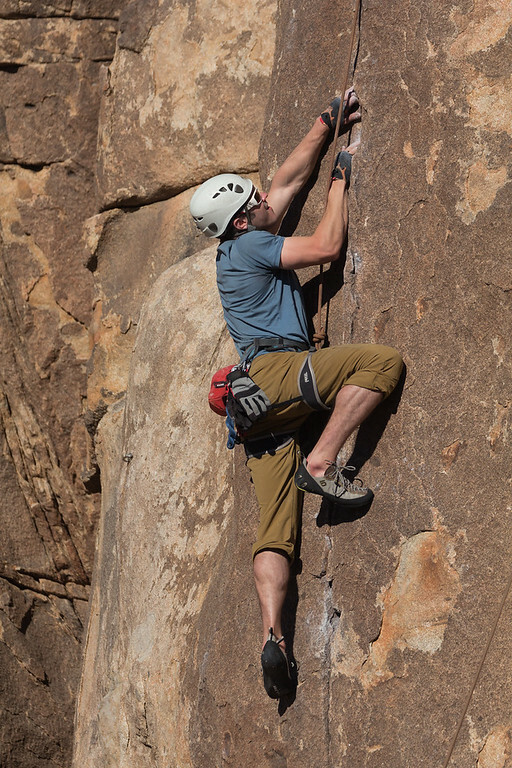 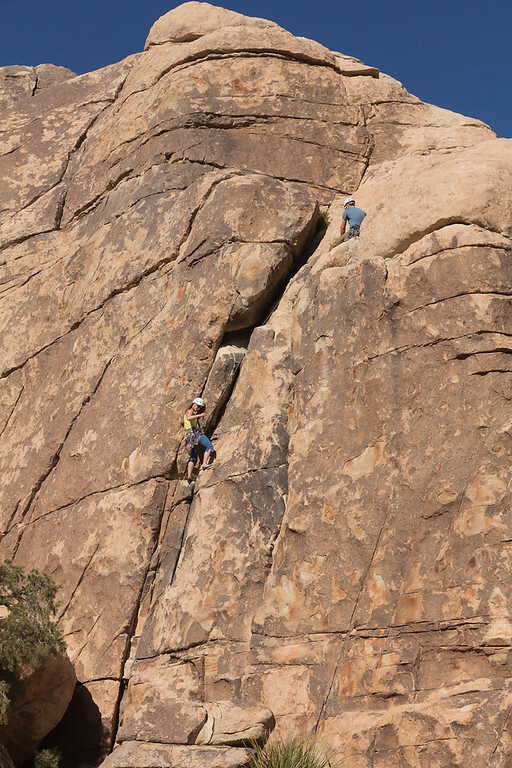 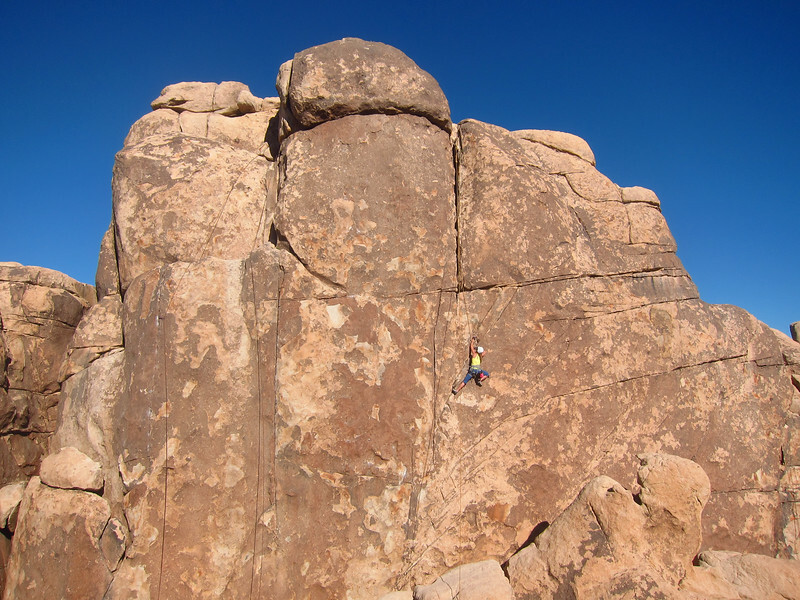 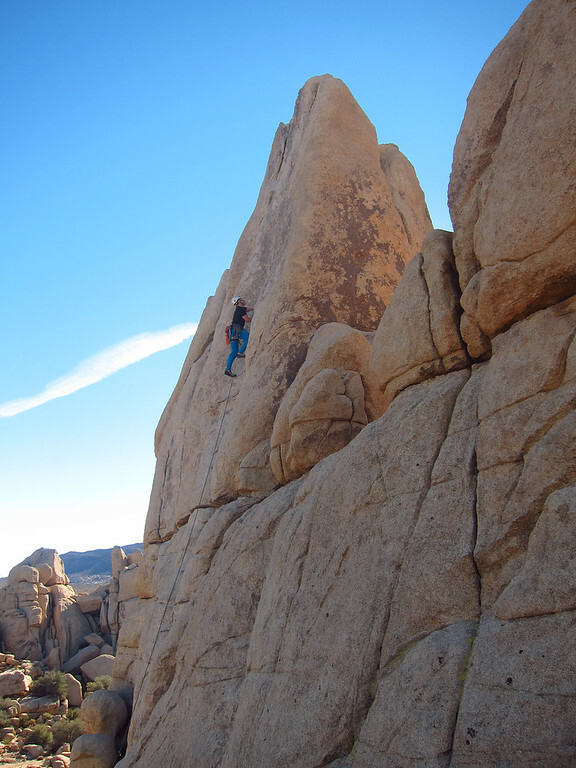 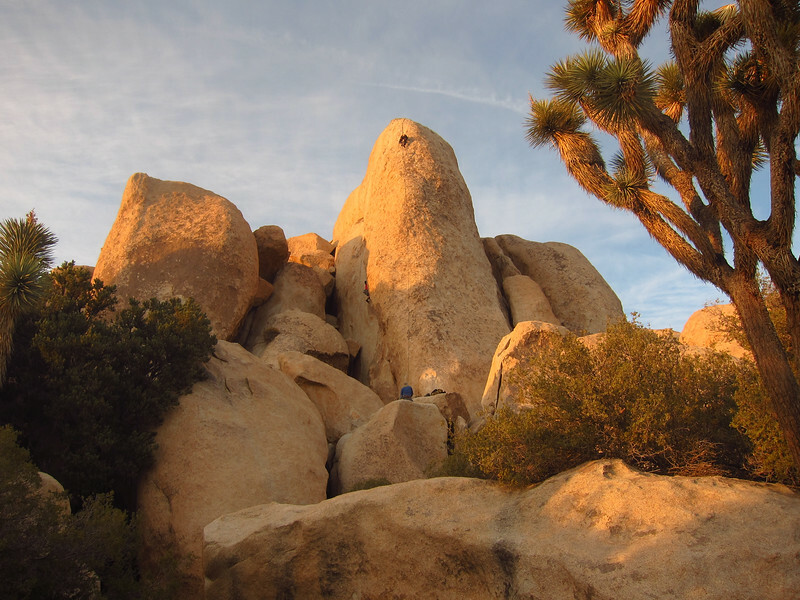 What is great about Joshua Tree is the routes are predominately single-pitched with essentially no approaches – in some cases you could literally belay from the car! 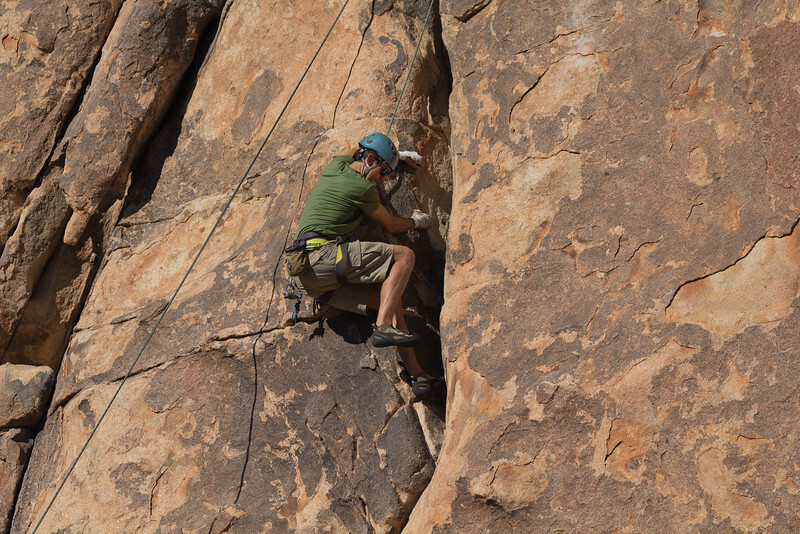 On several days we went to zones that we could set up multiple ropes on ajoining routes so we could all top-rope a number of routes quickly. 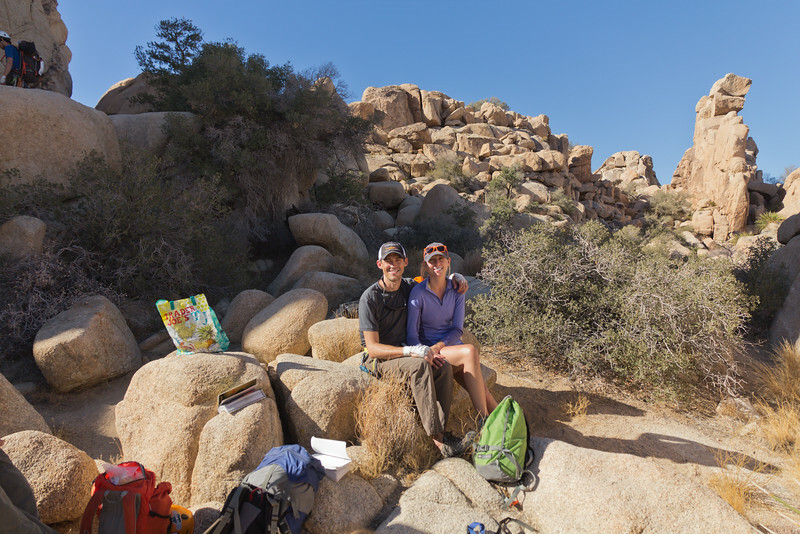 It was great to be able to sit and belay and hang out with Sarah. 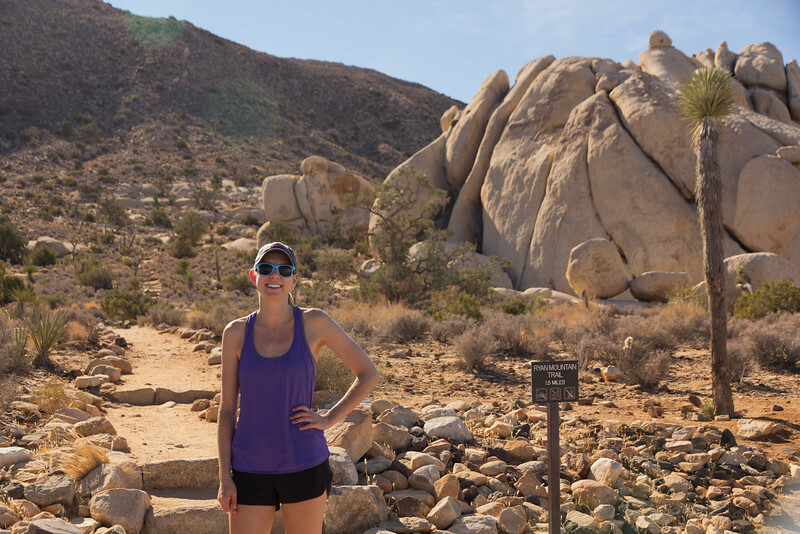 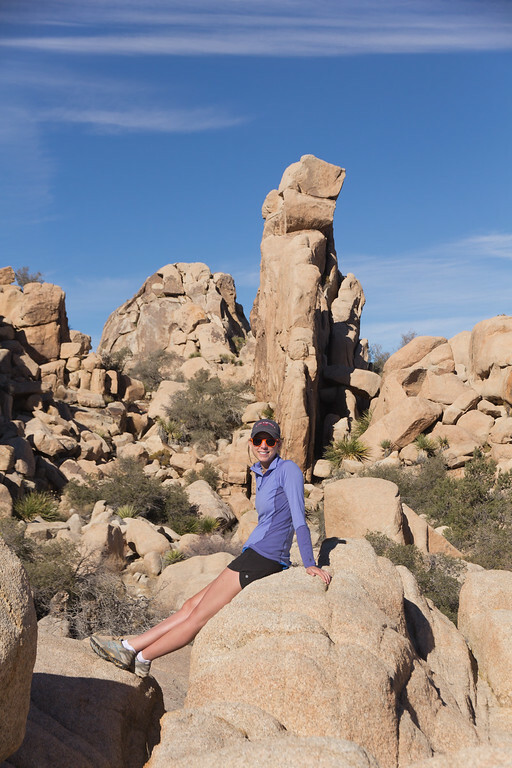 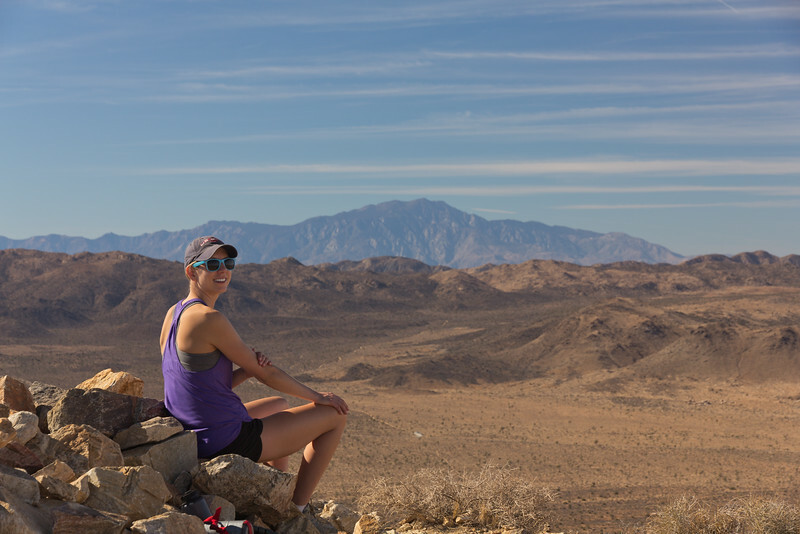 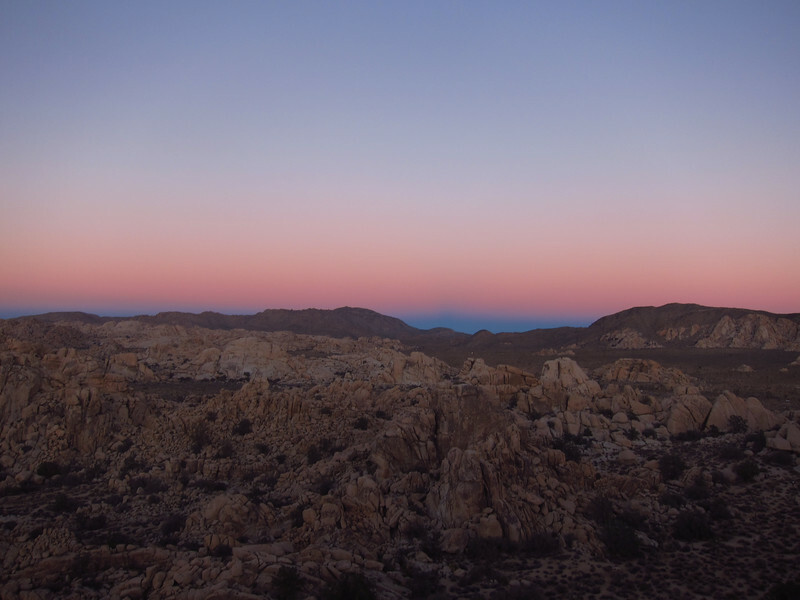 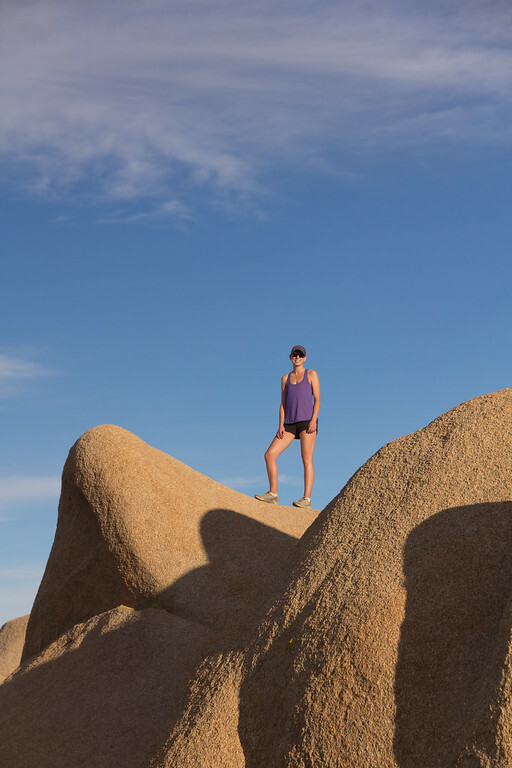 On Thanksgiving Day, Sarah and I planned on just exploring the Park as this was our first trip to Joshua Tree. 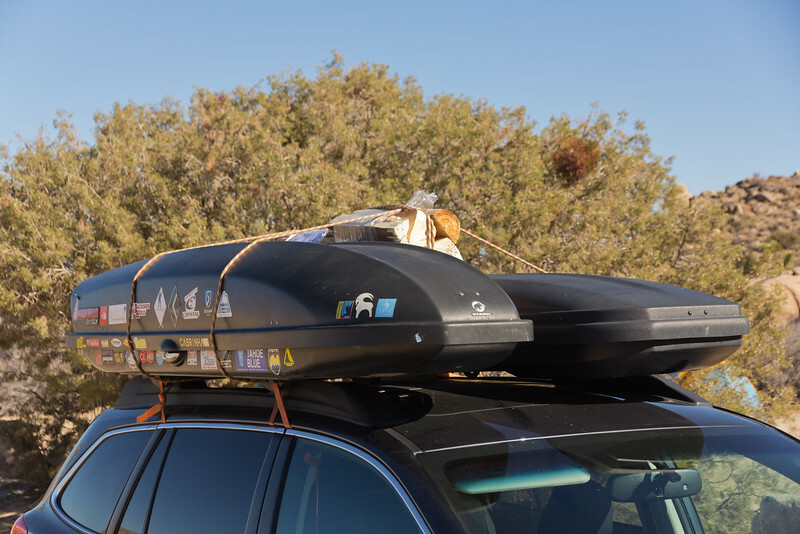 Jon, Judit, Alex and Andrew headed to go hike out to some climbs so we didn’t link up with them until the end of the day. 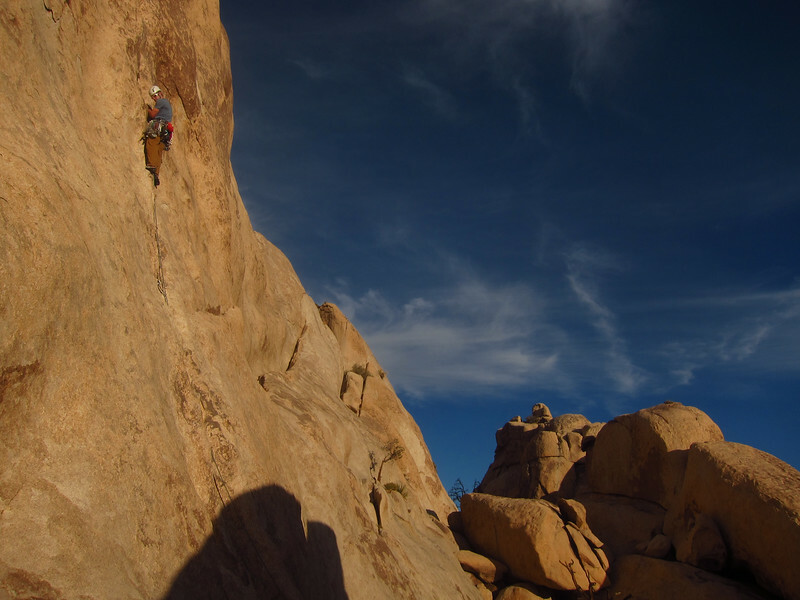 The next morning we all headed over to the Real Hidden Valley for a great day of cragging. 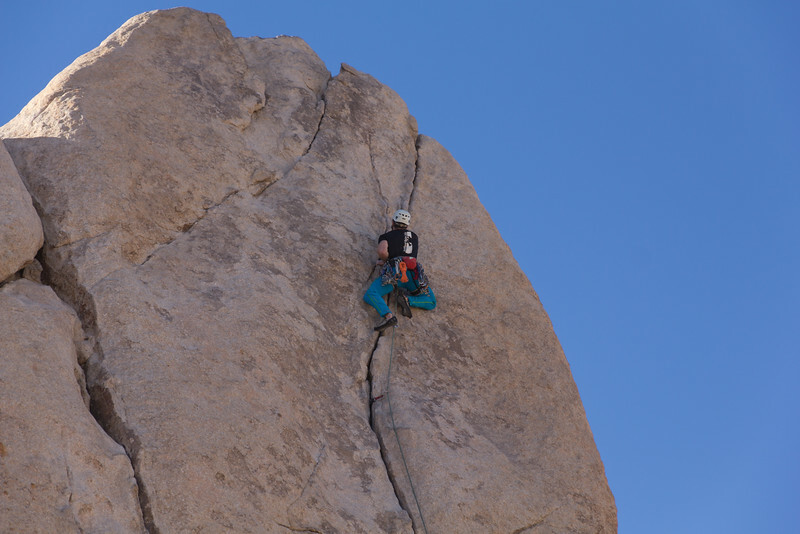 We went to a zone where it was easy for Jon to lead up one route and I scrambled around and set up a number of TRs on other routes. 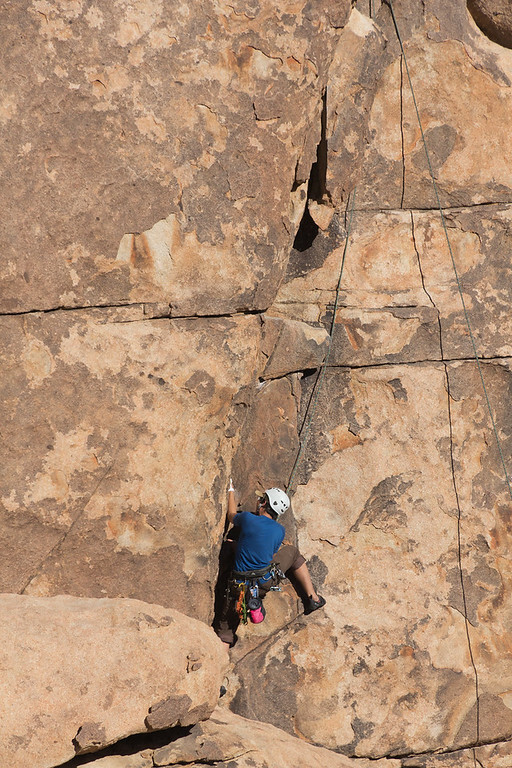 We ultimately had four ropes going on a variety of classic 5.10 crack climbs. 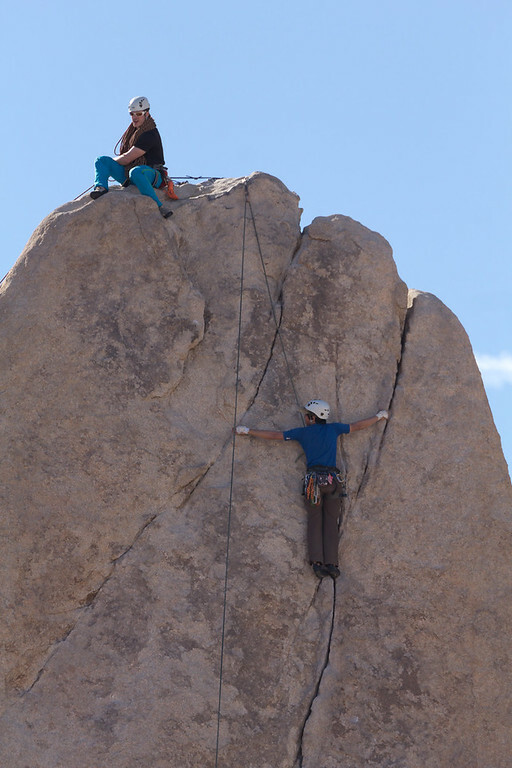 It was great as the belay stations were in the shade and we were all able to hang out when not climbing. 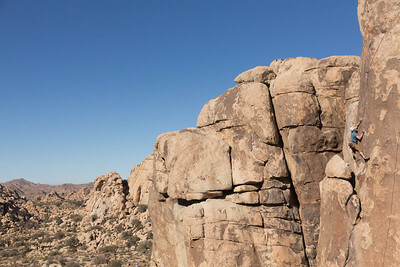 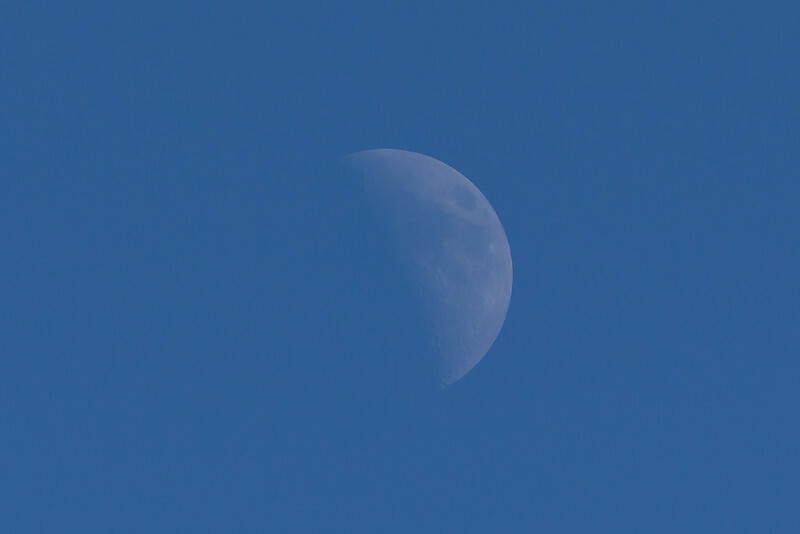 There was also a great formation right next to it that I could climb up on to get some shots with my big 400mm lens. 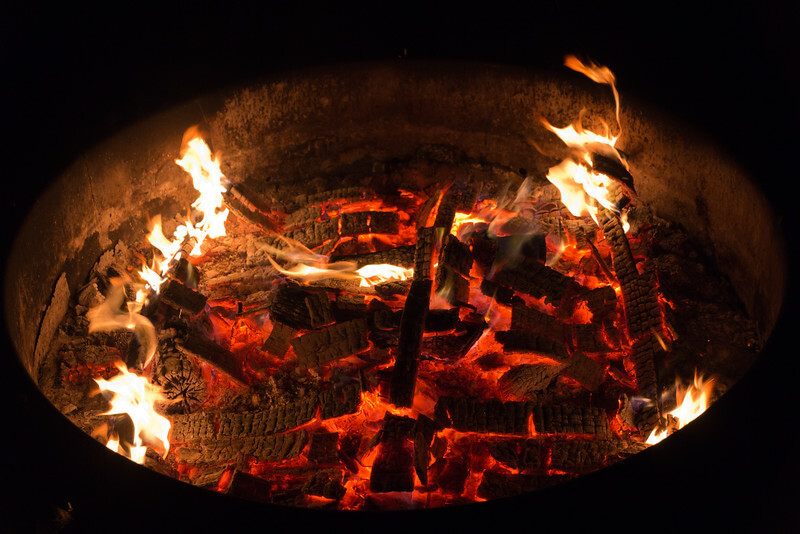 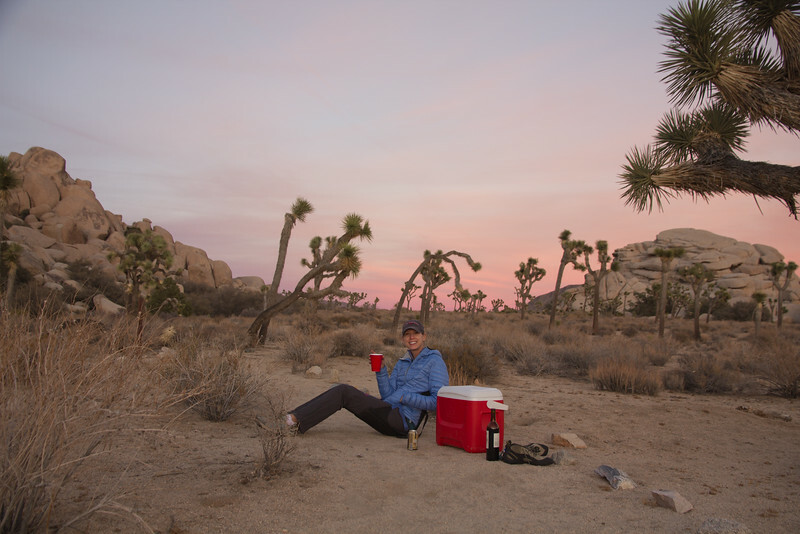 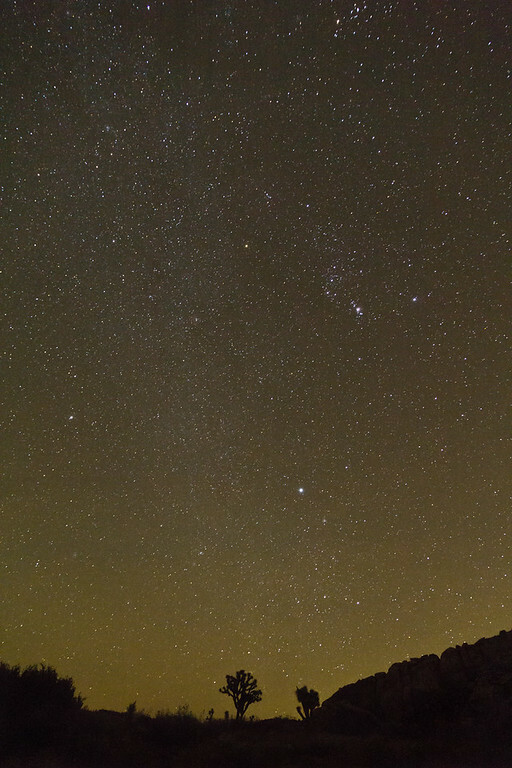 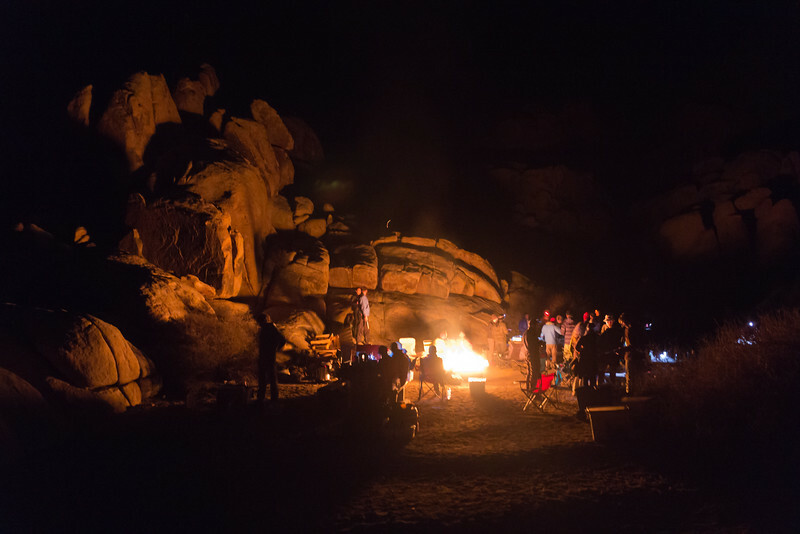 Over the campfire and some beers and wine that night, we all decided the easy access and abundance of quality climbing in the Real Hidden Valley was tough to beat, so we would head back there the next day. 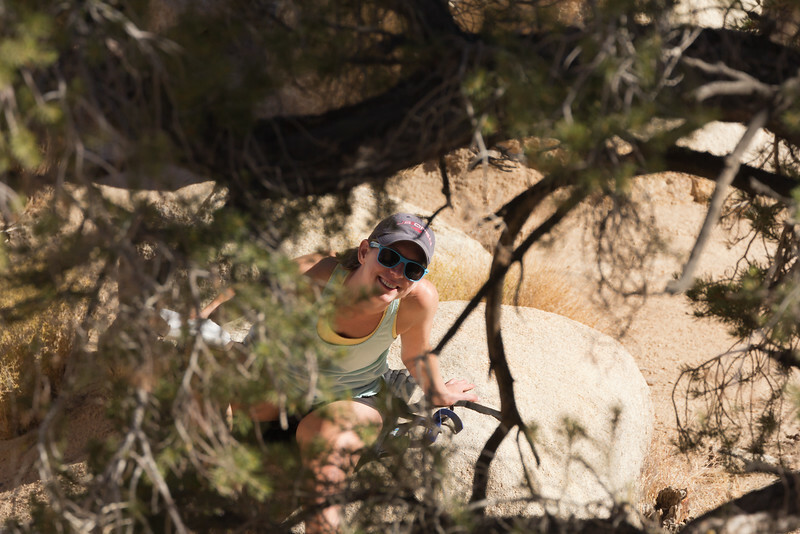 Although Sarah doesn’t climb, it was also an awesome area for her as we were all hanging out at the base of climbs all day out of the sun and just relaxing and chilling out. 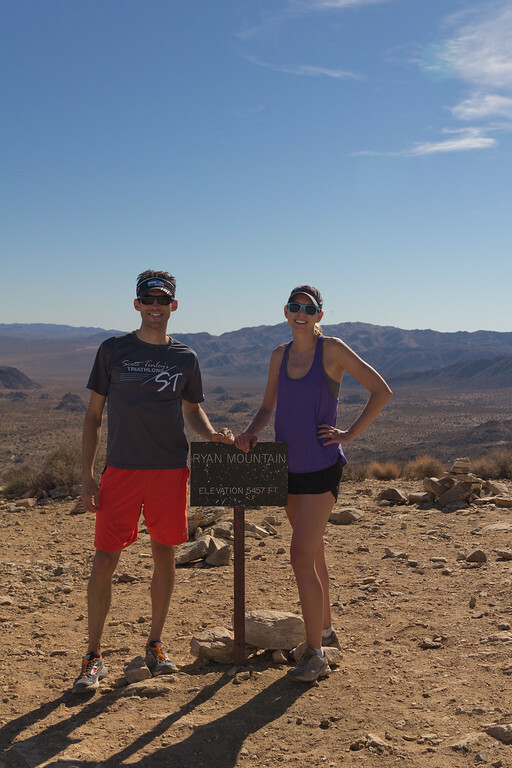 All in all, it was an awesome Thanksgiving with Sarah and we all really had a good time. 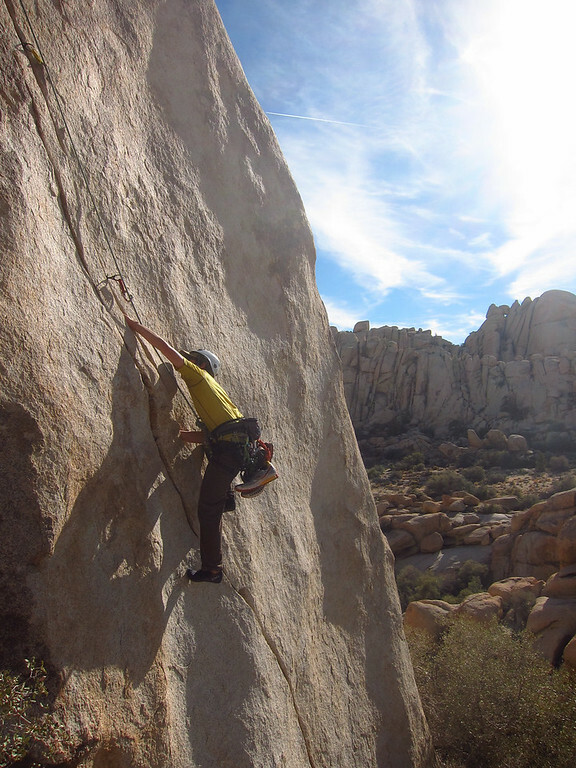 Good climbing with good friends.